This authentic retelling of two traditional Norwegian folk tales does nothing to make me like trolls or forest witches any more than I did before. Not that this was Norwegian-Australian author Lamond’s intention, I’m sure. The first tale, The Little Old Lady from around the Bend is the story of a poverty-stricken old woman who, in her younger days, makes the mistake of bargaining with and deceiving a family of trolls. She helps a mother troll give birth and as instructed, smears some balm on the baby’s eyes. However, she ignores the instruction not to get any in her own eyes. Her reward for helping the trolls is an endless delivery of silver coins. The catch is that she is not to spend, give away or speak of her new wealth and so she continues to live in abject poverty. When the girl sees the troll wife stealing from a local bakery, the trolls learn she had stolen some of the magic eye balm and the troll wife spitefully blinds her in one eye. The girl then gives one of her coins to a beggar, causing her stock of silver to immediately turn to a pile of dry leaves. The moral is not to disregard instructions. The second story, The Golden Ball of Yarn, is the tale of a woodcutter who works in the forests and one day is bewitched by a forest witch, a Huldra, who attracts his attention with a golden ball of yarn. From time to time the Huldra would spirit the man away. The man later marries, but still the Huldra tries to trick him and steal him away. In order to escape, the man sails to another land. The moral is not to be tempted by seemingly attractive offerings. Each of these stories is aptly complemented by Kallick’s rich and detailed drawings that invite the eye to linger on the page. 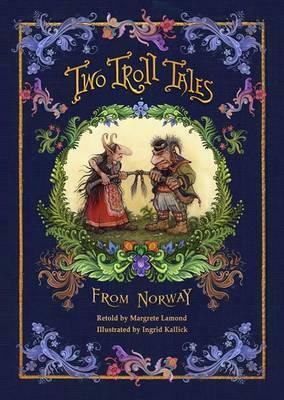 Here is another classic offering from Christmas Press that will leave young readers wanting to explore more enchanting international folktales.